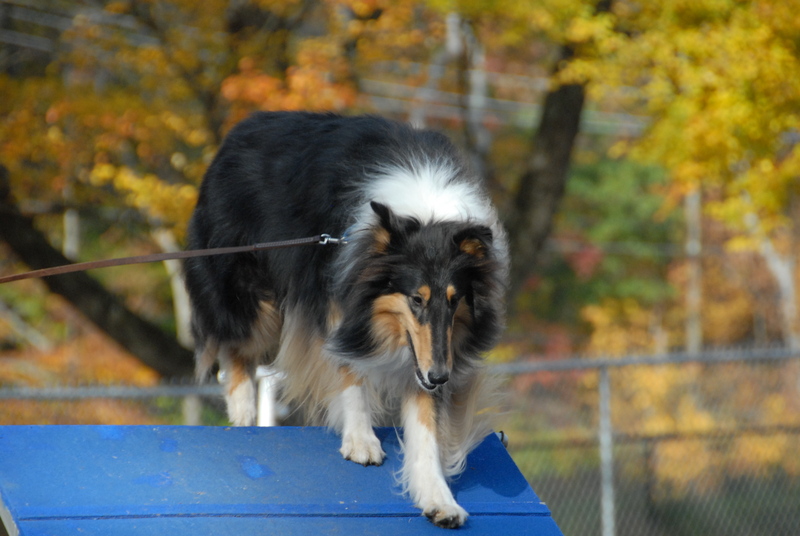 After missing week 6 of the agility class, I wasn’t sure exactly what Rags missed out on. I knew Tom was going to start 2×2 weave pole training during week 6 and Rags was going to deficient in that, but short of that, Rags seemed to be all caught up and performed well. 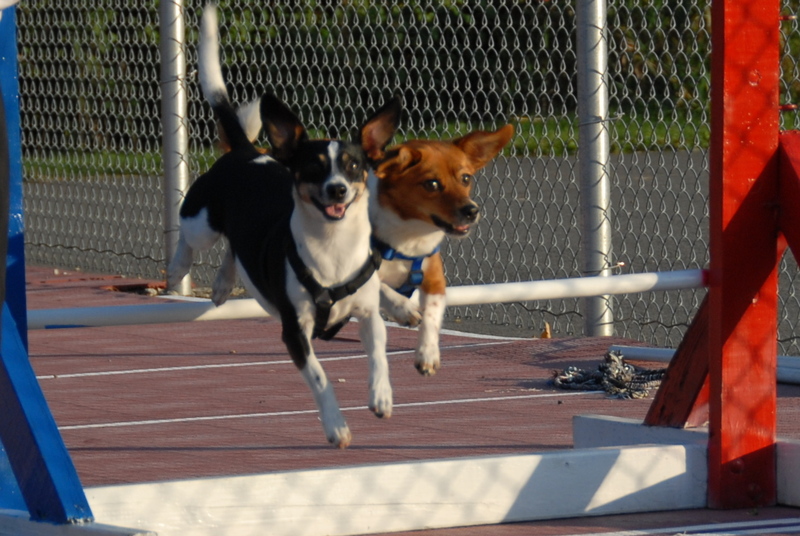 It probably helped that on Columbus Day, the Monday after week 5, both Rags and Scraps practiced some run-throughs that were offered by the k9 Campus. 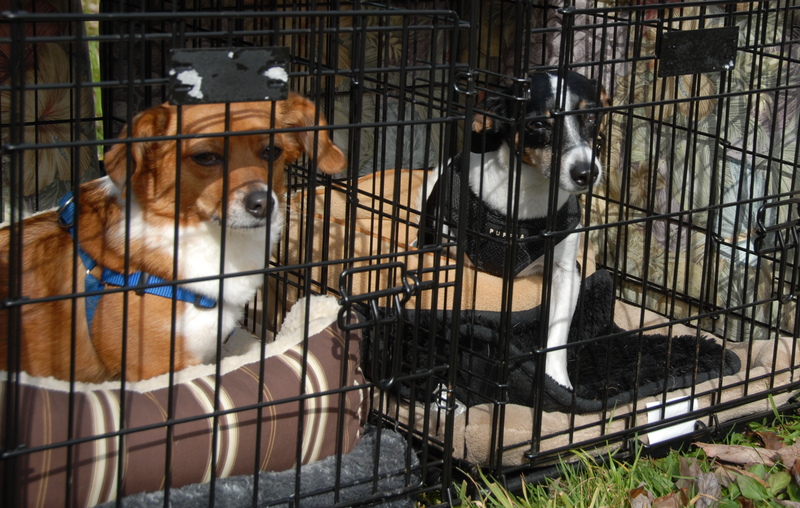 During those run-throughs Rags did really well on the A-frame and dog walk but had difficulties with tunnels. Click here to read the blog posting of those run-throughs. 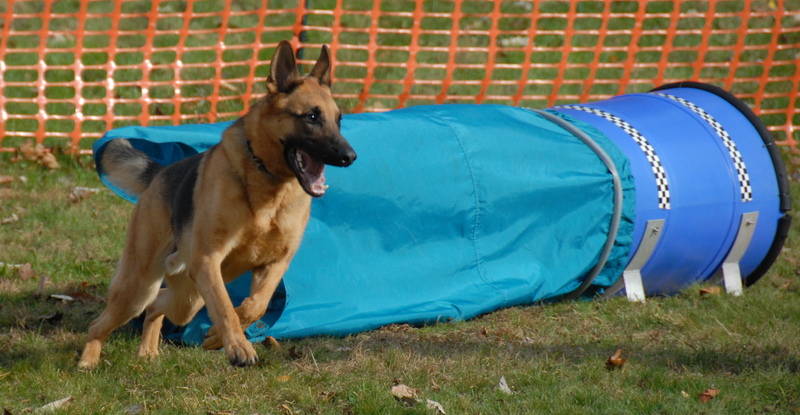 Week 7 class started with chute training with putting the fabric closing at the end of the chute more and more closed as the dogs progressed. Though rags never really practiced the chute, she had no issues with it and pushed her way through the chute each and every time she had a chance. We next practiced the A-frame and Rags likes this piece of equipment and her target practice is paying off as she explodes for the target once given the command and hangs out in a good position at the end of the contact until I tell her to “let’s go.” We had a similar sucess with the dog walk where her targeting practice was the crucial element in getting her to perform it well. 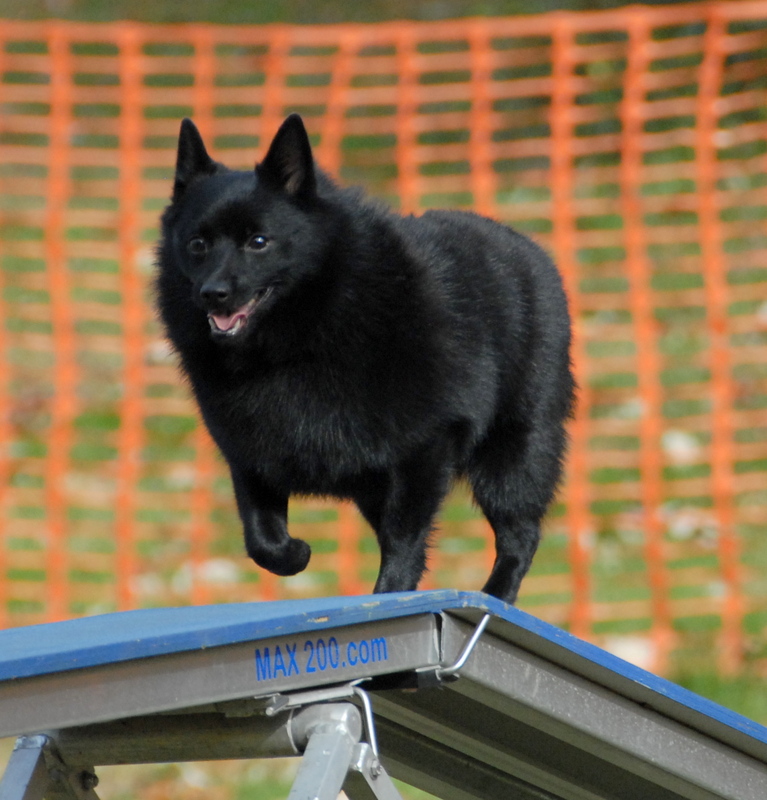 She has surprising good speed and excitements going over both the A-frame and the dog walk. Next we did a little tunnel practice, and unlike the run-throughs from 2 weeks ago, Rags did these well. The difference may be that were were only doing one or 2 obstacles and then rewarding with food and the tunnels were all straight. We closed week 7 by practicing a single set of 2×2 weave poles. 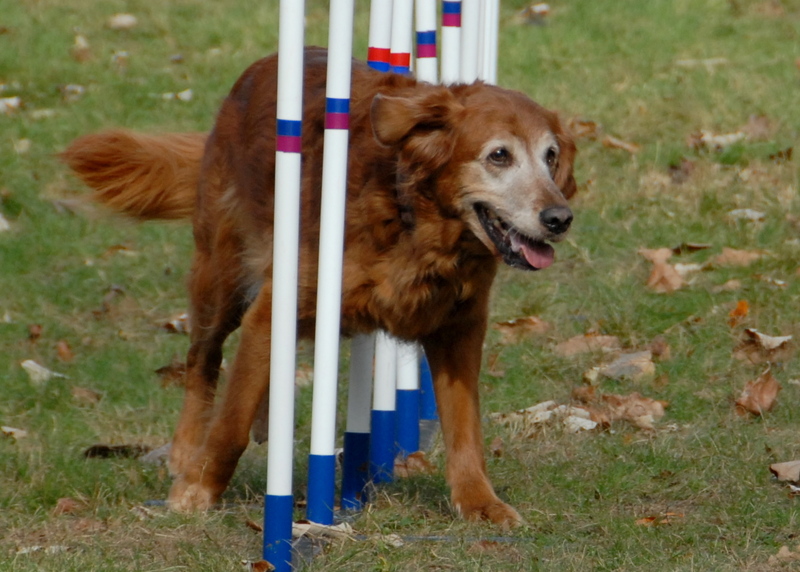 For a while I had Rags very interested in her heart squeaky toy and she eventually got the idea to go through the single set of poles. Now we just need to keep practicing all of this in the off-time. 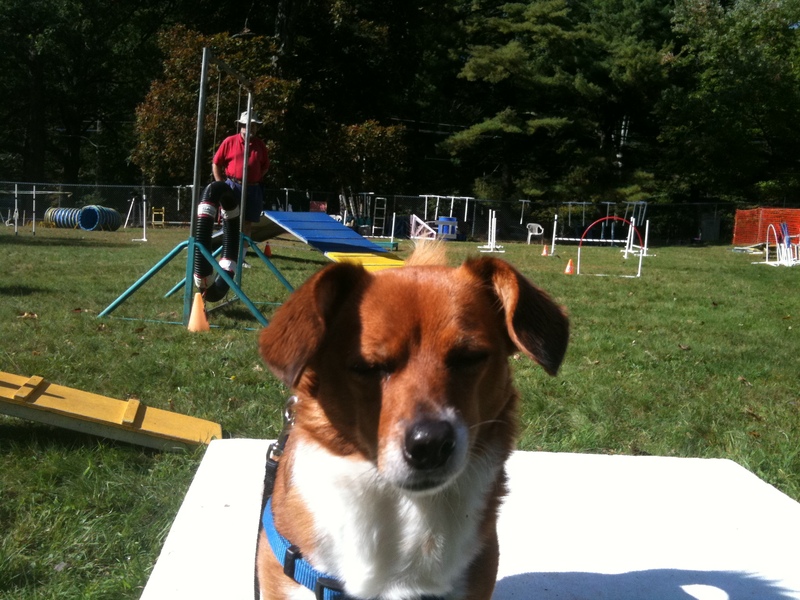 With graduation coming up next week, Tom is suggesting proceeding to the advanced-beginner agility class which will be offered by St Huberts at their indoor ring starting in November. 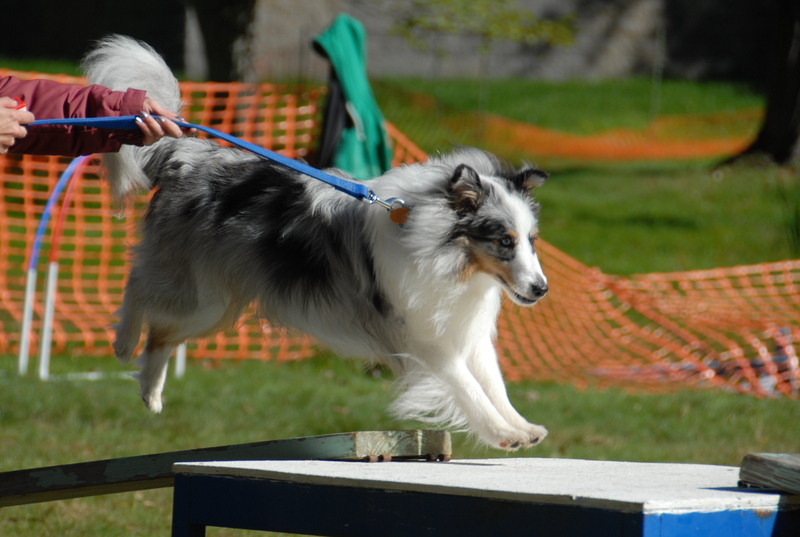 I am assuming that we will sign Rags up for that and hopefully have her in some type of agility shape to start competing for real in the spring. 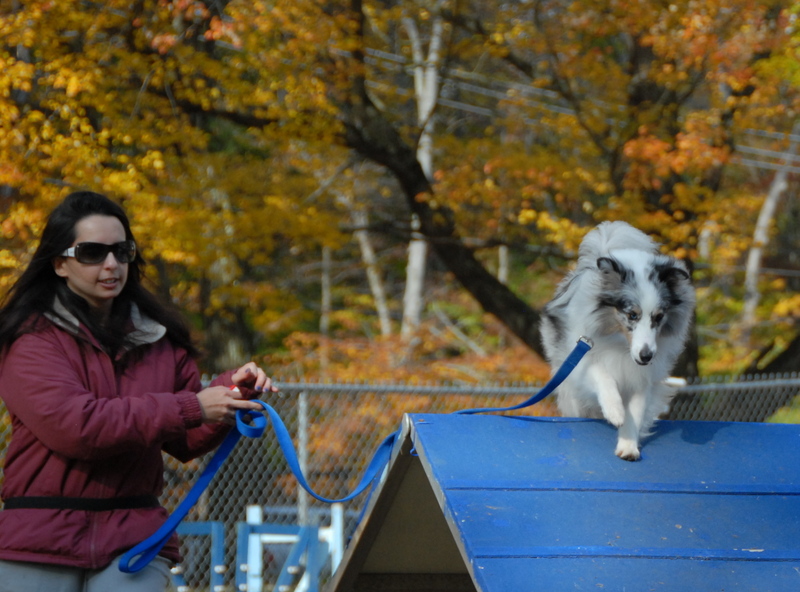 After week 5 of beginner’s agility class with Rags and with the day off on Monday for Columbus day, we decided to enter both Scraps and Rags in a one hour session of agility run throughs at the K9 Campus in Randolph. 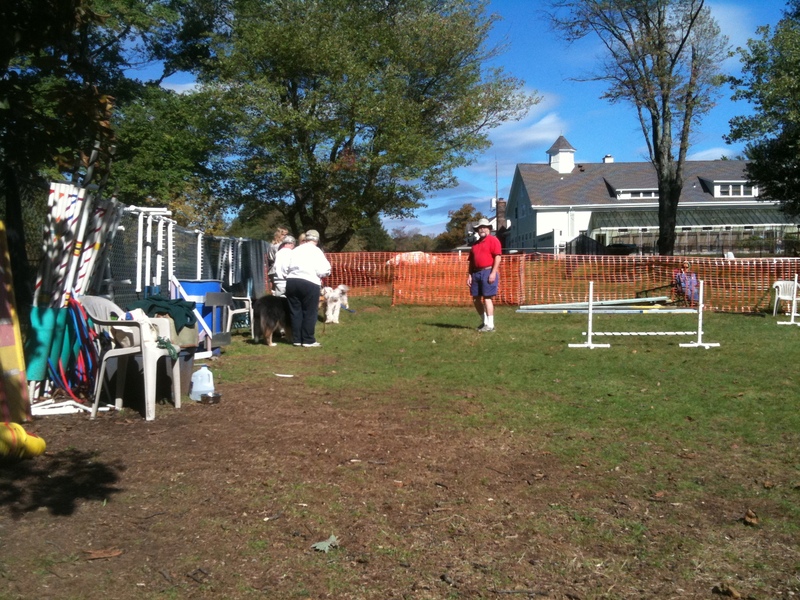 We shared in agility ring with 2 other dogs including Honey Bunny who we had class with a few years ago at St. Huberts. 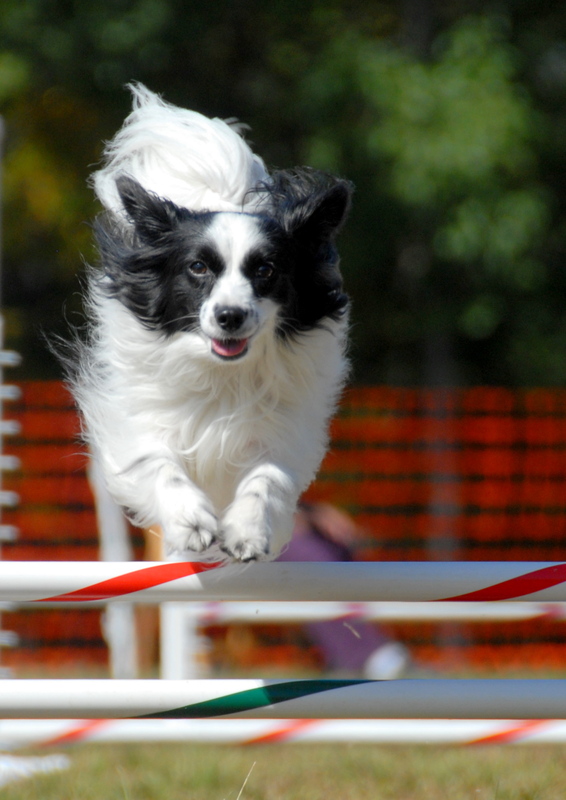 The session was set up as a very tight and complicated agility course and you had 2 minutes to run you dog and do whatever you wanted. It felt like too long of a time to have your dog perform. 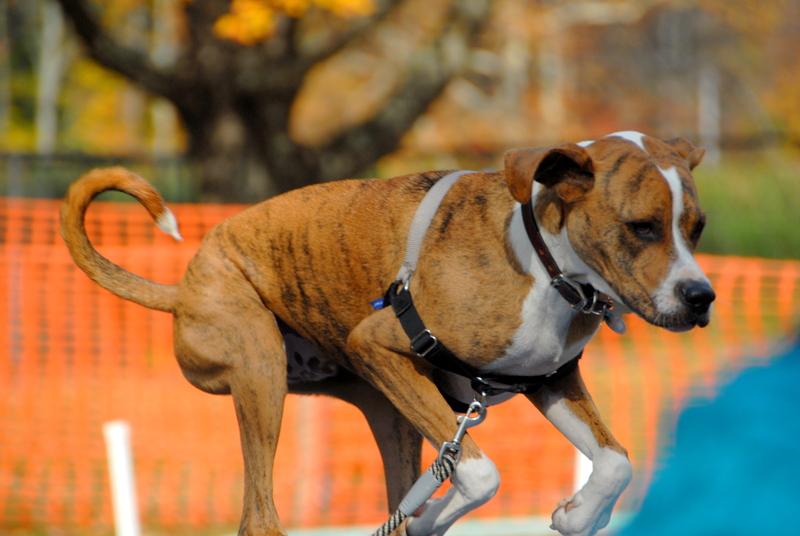 I think a 1 minute time frame is better practice for the dog. It’s just too much for them to do in a 2 minute period. Focus and concentration can’t be expected to be kept for that long. With that said, Scraps and Rags both got 5 runs in at 2 minutes per run. Rags did here A-Frame and dog walk great and performed on jumps and tires pretty well. The tunnel was her achilles heal in what we tried. We never attempted the weave poles or teeter. Scraps did really well. He took most of his obstacles as directed. On the way to class we were listening to 1010 WINS new radio on this October 10, 2010 (10/10/10) at 10:00 a.m. They say timing is everything, this is just something. When we arrive at 10:15 we were ready to practice more of what we learned and to increase the difficulty as we progress. The weather was sunny and warm so I took advantage of the time between some of the runs to snap some shots of my fellow classmates learning the obstacles. We started with tunnel practice where the tunnel was extended to almost full length. Through Rags missed the tunnel once during the 4 tries she did recognize the tunnel and accelerated through it nicely. We then went to the A-frame, but this week it was one level steeper and higher. Rags once again recognized the obstacle and accelerated onto it and at the apex the “target” command made her look to the target at the end of the contact and accelerate toward it. Additionally, Rags was nicely staying at the bottom of the contact until I gave her an “okay” when we would would run off. We next practiced the plank/dog walk using two boards and the table as a dog walk. This time we were at a 16″ table instead of 8″. Rags did this very well and once again performing a good contact and target. We then adjusted this drill to make the plank go off at a 90 degree angle to slow the dogs up at the top and let them think a little about what they were doing. We closed week 5 with learning the table and doing a sit on it and then a release. next week we will progress to the down o the table for a 5-count. Doing a down in the sphinx position is what you want for this obstacle. 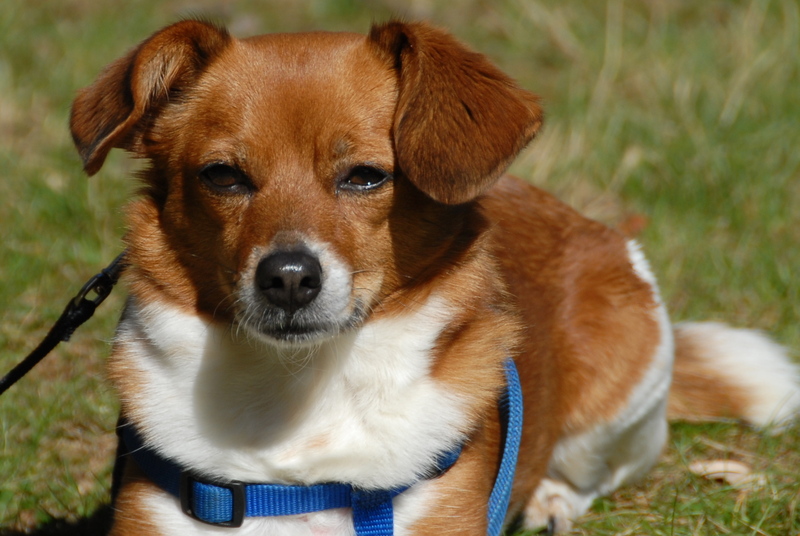 Fortunately Rags naturally stays down in a good sphinx position. The last thing Tom discussed and showed us was how he was going to use his newly learned 2×2 weave pole technique to teach our dogs how to do the weave poles. That is pretty exciting since the channel technique is excruciatingly slow especially when you down have your own channeling weave poles to practice on. 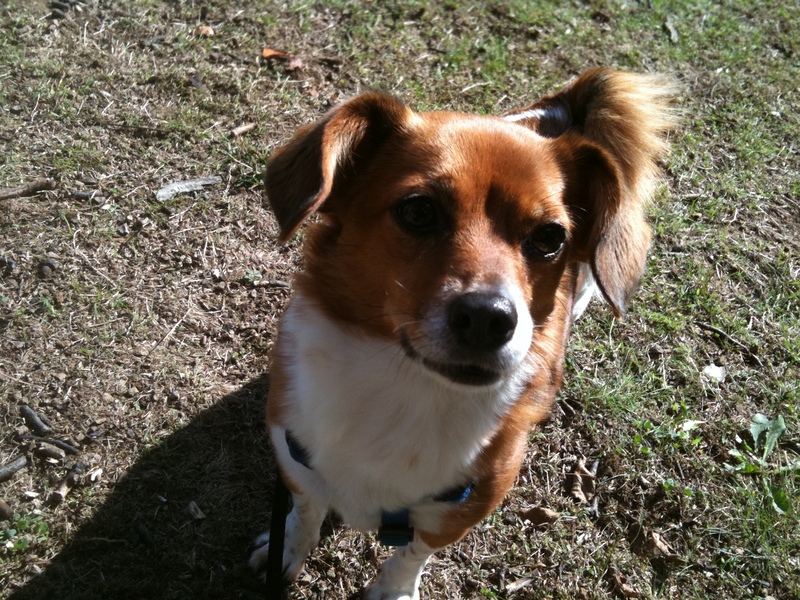 We will have to remember to bring a a toy for Rags to chase through the 2×2 weave poles next week. 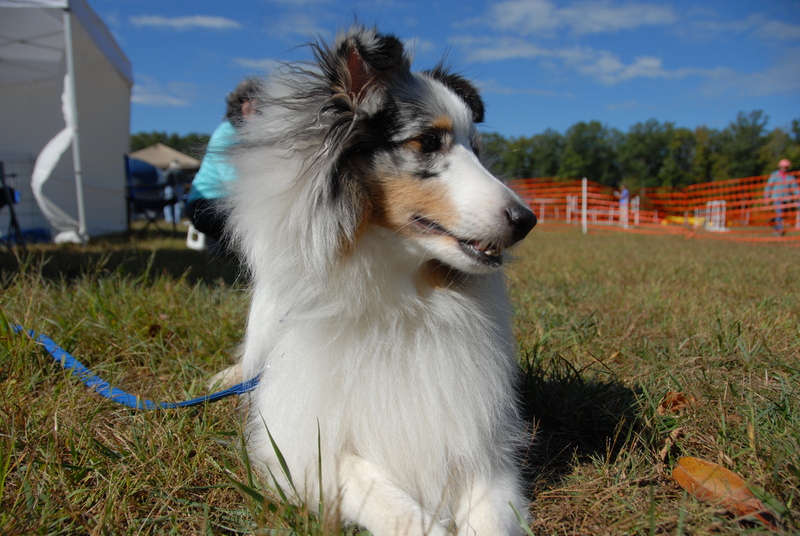 I was alone with Rags this week 4 of agility class since Scraps and Kathy were over at Lewis Morris Park at the CPE trial. We there fore have no footage except for the pictures I quickly took with my iPhone. 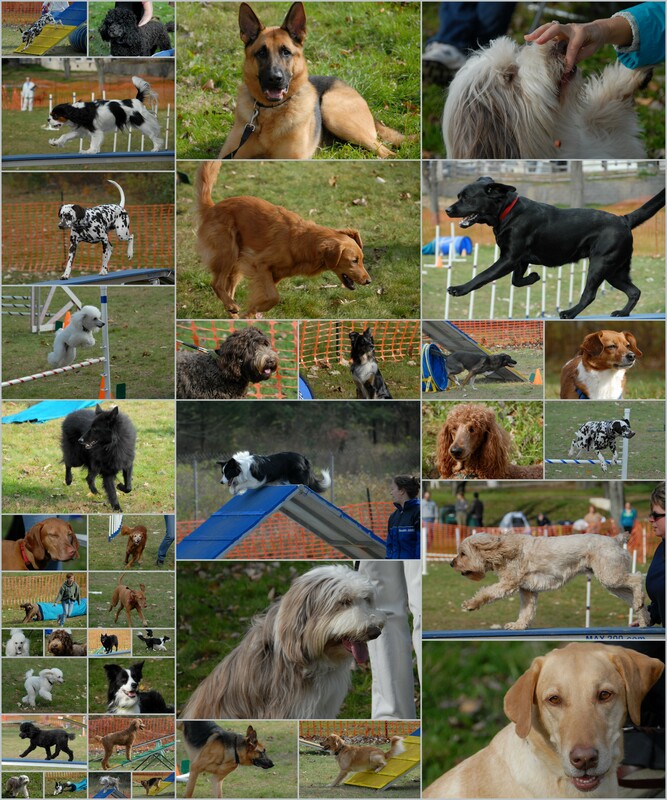 I attended the first run of the day at Lewis Morris and then headed home to pick up Rags and head to the 10:15 class. With the Morristown Fall festival going on and some race at the Morris Township Town Hall, which closed off Woodland Ave., it made getting to class on time a challenge. Though 5 minutes late, I didn’t miss any activity. 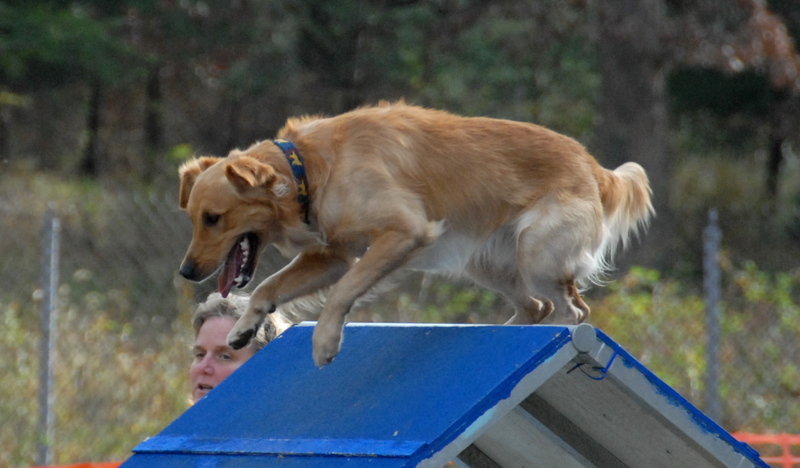 We went over our first actual jumps of the class, which were set low at 8″, but that is the height Rags will be jumping at so it was good practice for us considering Rags already knows how to jump. 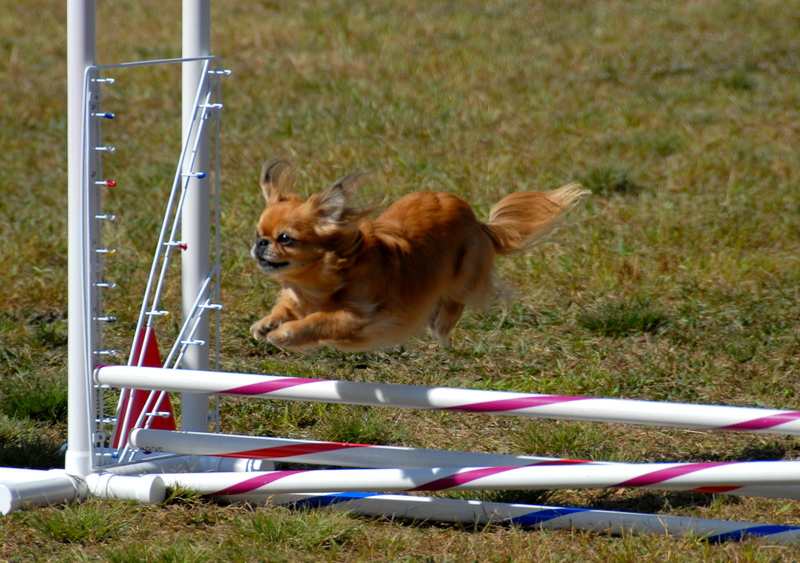 First we went over 4 jumps lined up in a row on with the dog on both sides of me and then Tom set the 4 jumps up as a pin wheel where we did good practice with the dog following our hands in a tight circle while going over jumps. Rags did really well at all of this. Next we learned about the A-frame which was set up at a very shallow angle. We did this also with the dog on both sides of us. Rags also did this well. She had no problem addressing the frame and when the “target” command was issued at the top of the frame she focused on the bottom and hit her target, like it is supposed to work. We then worked on going through a tire which was easy for Rags but I had my own problems coordinating my hands. We then practiced the tire at severe angels. 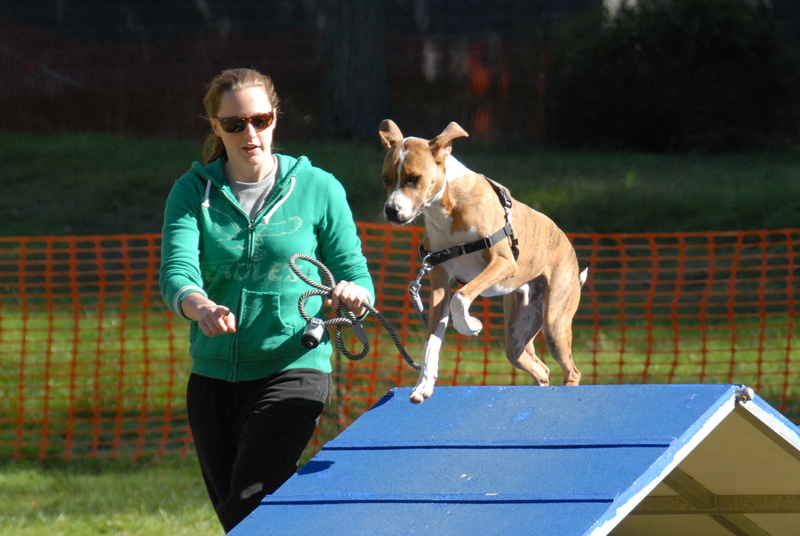 The class closed with us doing figure 8s with the dog going over two jumps. Rags and I also did this really well. I was very pleased with Rags’ performance in class and her focus on me. At the end of the class I announced that the trial at Lewis Morris would be going on all day and it is a great opportunity for any of the other students in class to go to a trial and see what it is all about. Casper and her mom Kathy took me up on the offer and we saw them over at Lewis Morris when I arrived after dropping Rags off. Next Sunday is week 5. Hopefully Rags continues to improve.